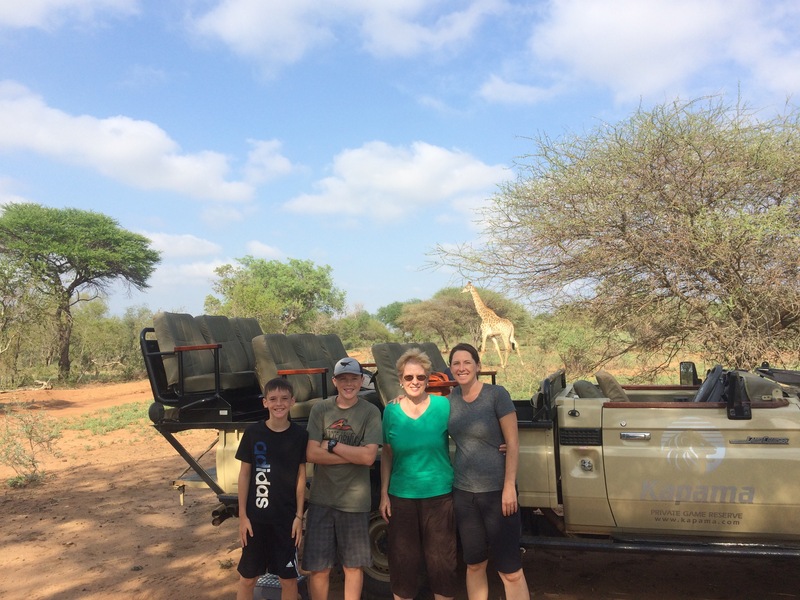 Going on an African safari is something that is near the top of many people’s bucket lists. If it’s not on yours and you like traveling at all, I recommend that you should add it. There is simply nothing that can compare to seeing animals in their natural habitat. 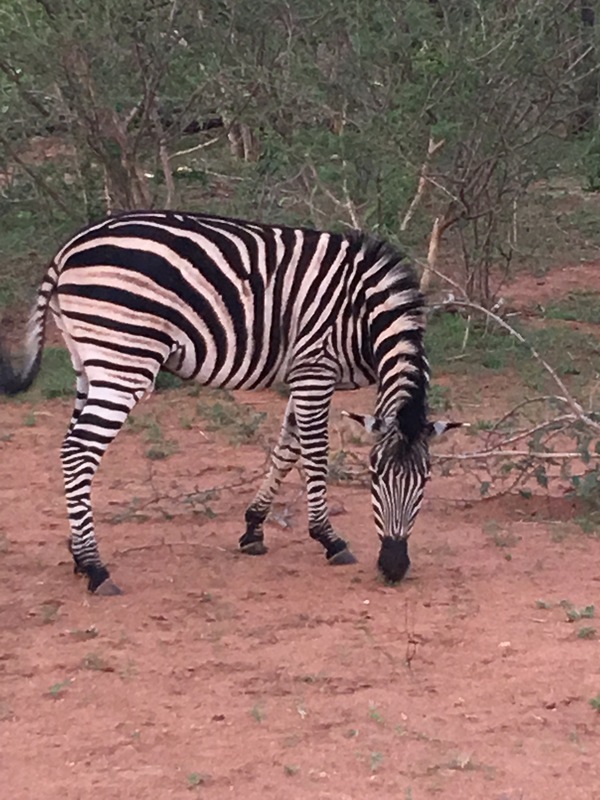 We were within 10 feet or less of lions, elephants, rhinoceros, buffalos and many others. 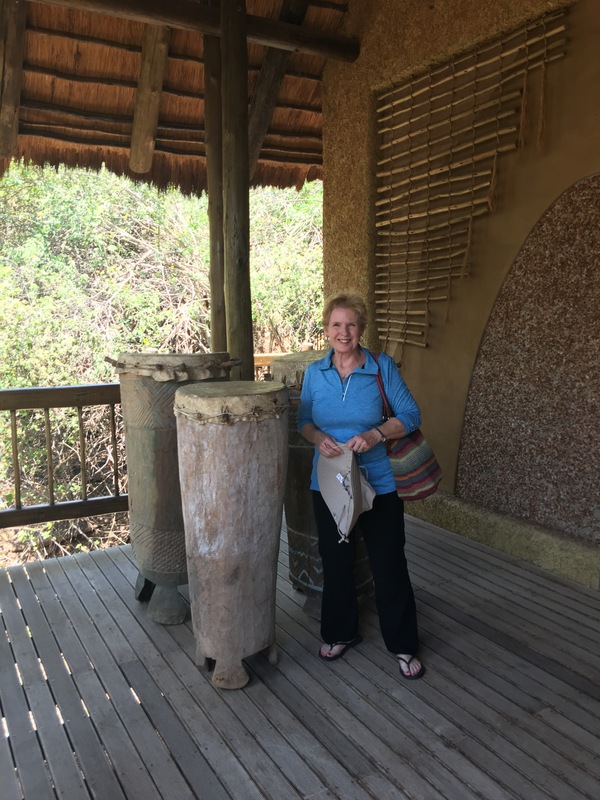 We were able to go on safari excursions in Kasane and Maun, Botswana which I wrote about a couple posts ago, but in South Africa we were able to explore even more ecosystems and habitats via safari. 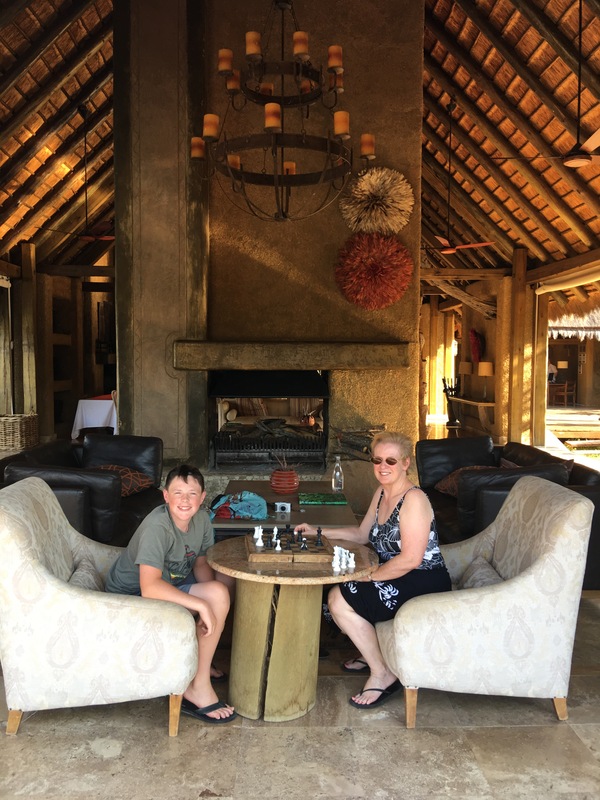 We spent an incredible 4 days having a true safari experience in Kapama Game reserve, self guided ourselves through Kruger National Park, and spent a few days exploring St. Lucia and iSimangaliso Wetland Park. 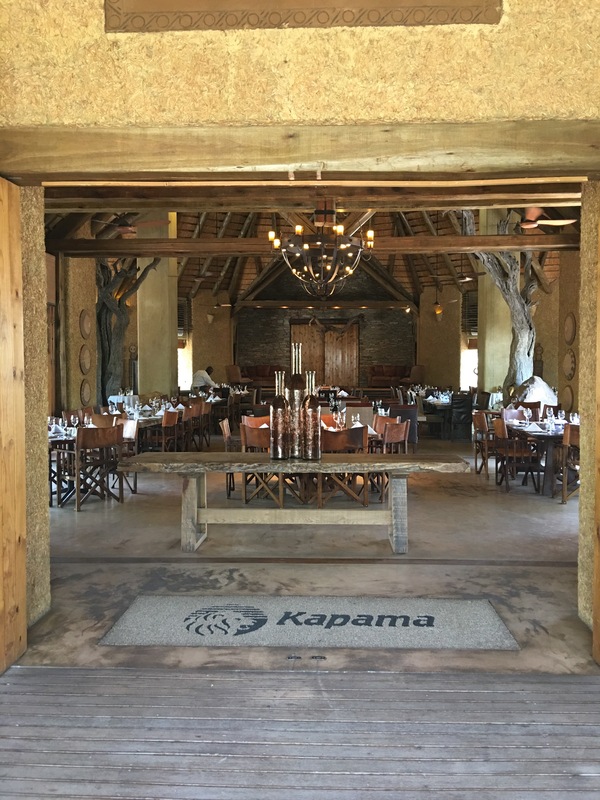 When you think of going on safari, our experience at the Kapama Game Reserve is probably what you are thinking. 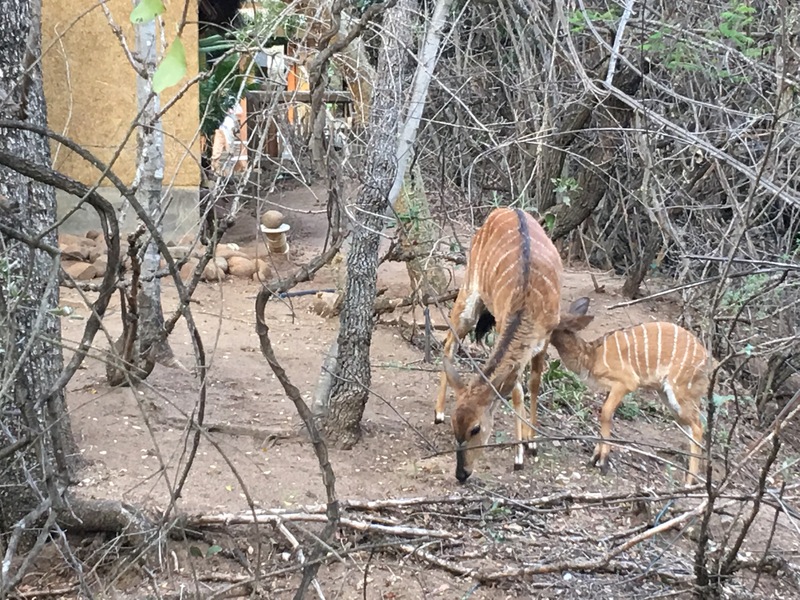 Living out in a safari lodge surrounded by animals, going on game drives, and experiencing Africa at its finest. It was an incredible experience and worth every penny. 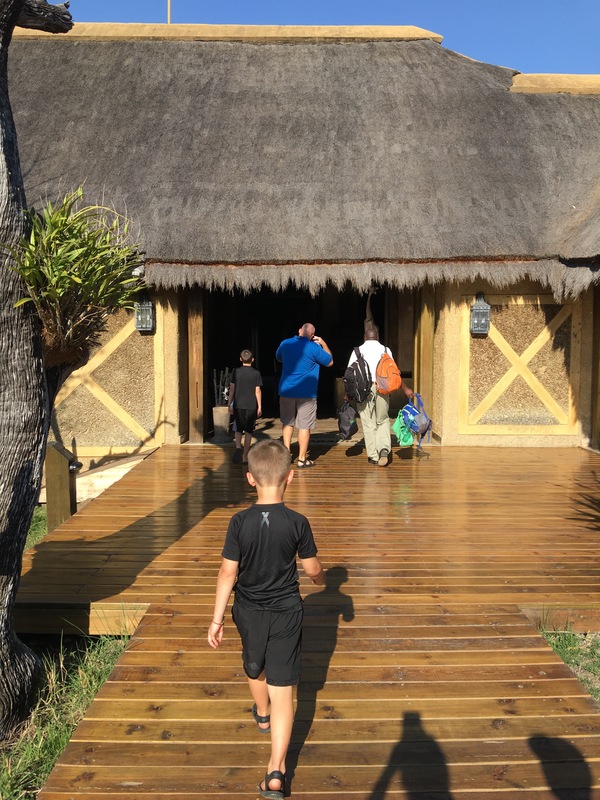 Each day we followed a similar schedule that maximized our time to see the animals, provided time for relaxation and of course, lots of amazing food. Animals are most active in the early morning, especially at dusk because it is cooler, so that’s when the game drives were scheduled. We would get up early, get ready for the day and have a light breakfast before we left the lodge on the game drive. We had all of our meals except dinner in a beautiful open restaurant. 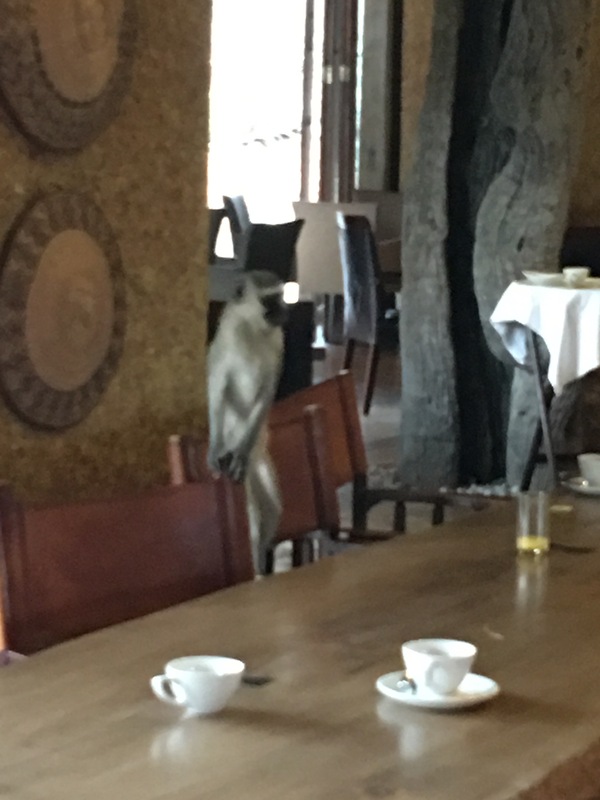 We all loved to watch the Vervet monkeys try to sneak in and steal food. Well, all the guests did, the staff did their best to scare them away before they took too much food! They were quick little guys and seemed to get away with a bounty of food every time we were there. Tyler tried to follow one out one time and it threw an apple at him, so we learned to keep our distance! There were 7 of us in our group (the 5 of us and my parents) so we had an entire jeep just for our group which was nice. 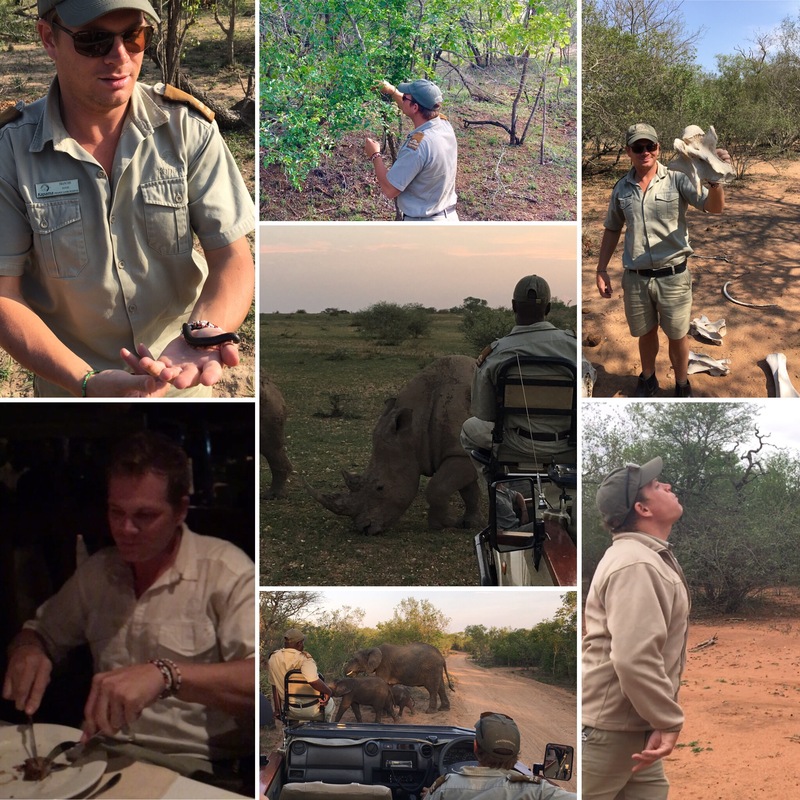 We were also assigned a guide, Francois, who took us on every game drive and even had dinner with us each evening. Francois was so knowledgeable, there didn’t seem to be a question we asked that he didn’t have an answer at the ready. 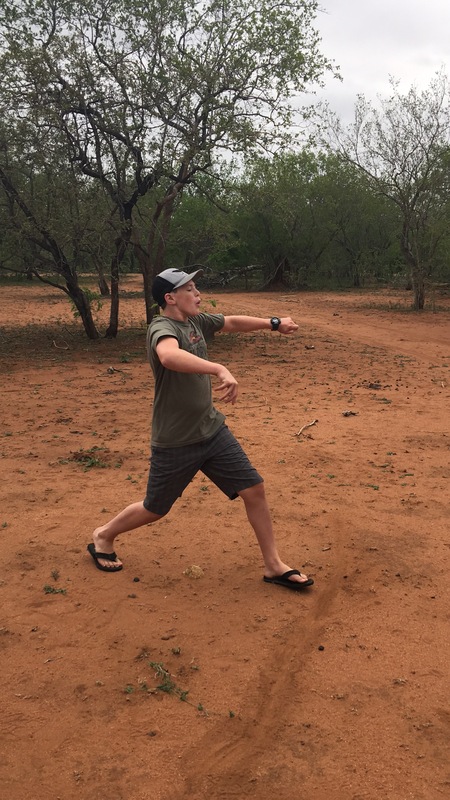 We also had a tracker, Lassi, who assisted Francois and did a great job of tracking the animals so we could experience some spectacular sightings. 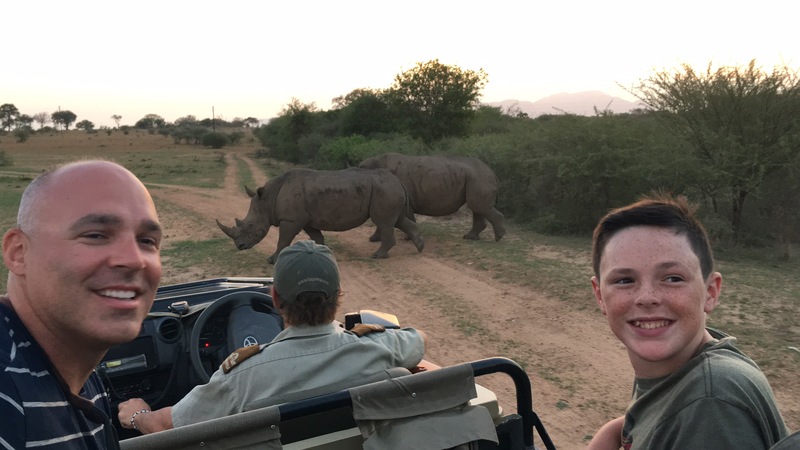 Each drive we were assigned a quadrant of the reserve to explore so there weren’t too many safari vehicles in one area and we didn’t disturb the animals too much. 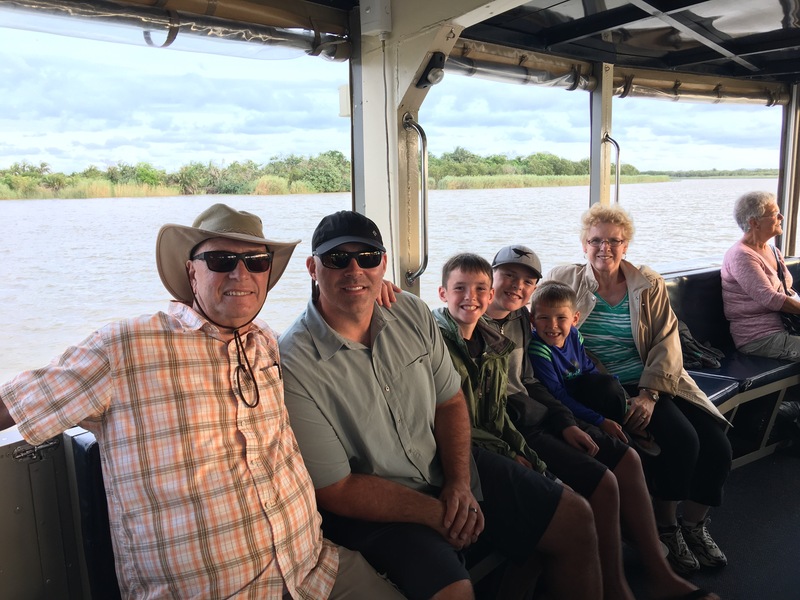 This worked out as planned, which allowed us to see a large variety of animals and have fantastic experiences each time we went out. Most of my good pictures were taken with our actual camera which is difficult to transfer to my blog, but here are a few of the animals we saw from iPhone pictures. On each of our morning drives, about half way through, Francois would look for a safe area, free of animals, for us to to stretch our legs. 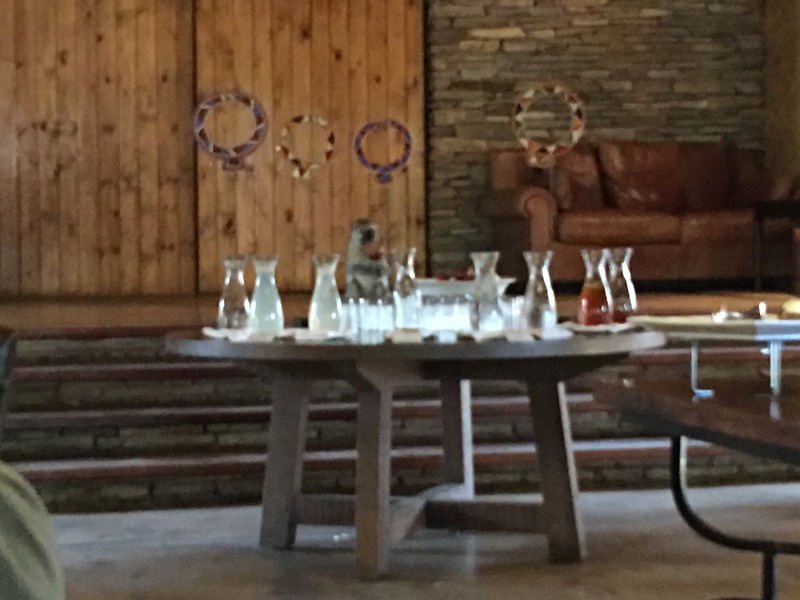 They would set a table up for hot chocolate and rusks (hard biscuits that were surprisingly good, especially when dipped in hot chocolate). 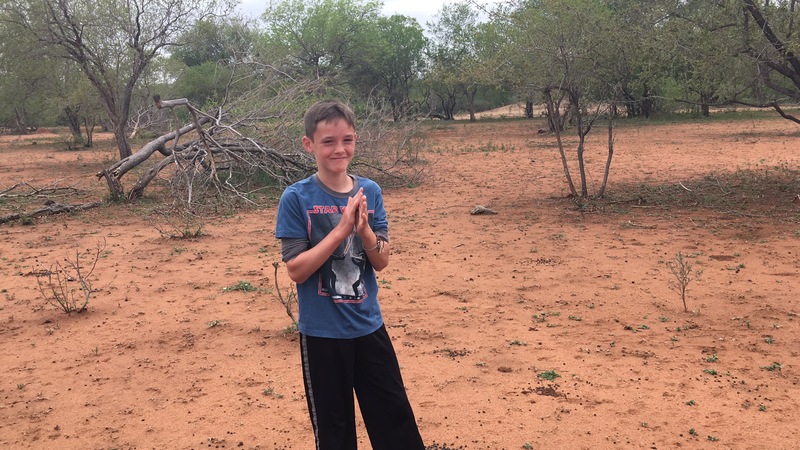 While on the drive, he would explain some of the smaller things that were harder to see while driving in the vehicle like dung beetles, weaver birds, spider condos, and more. The most memorable thing Francois taught us though, had to be the fine art of dung spitting! Yes, it is exactly what you think it is. At first I thought he was joking and this was something similar to a snipe hunt in the USA, but no, this is for real. 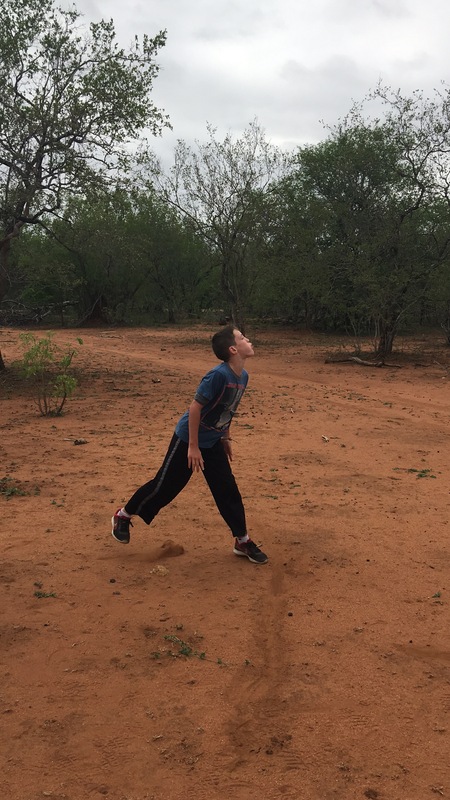 Francois grew up in South Africa and as a child he would actually play this game with his friends. 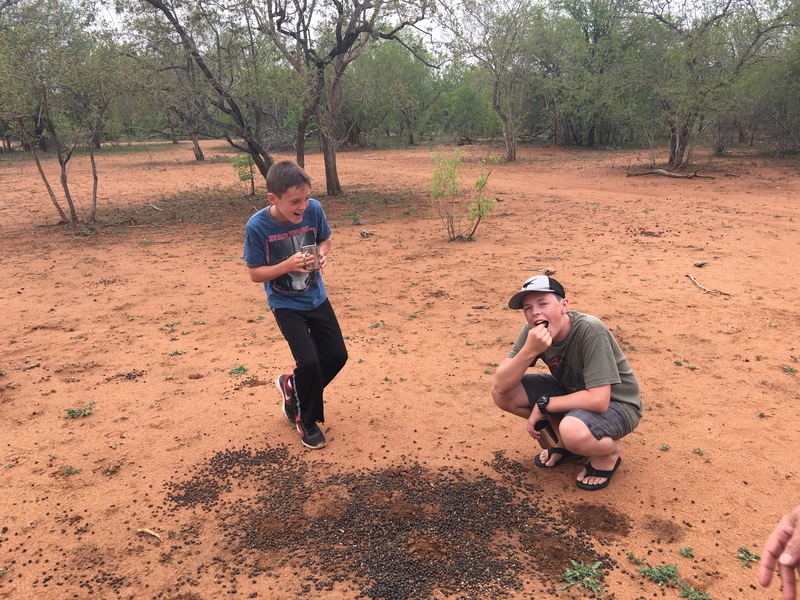 The following is a direct quote from Francois as he demonstrated dung spitting to us, clarifying beforehand that this can only be done with “dung,” which is poop from an herbivore, not from feces from an omnivore or carnivore (that would be sure to make you sick). 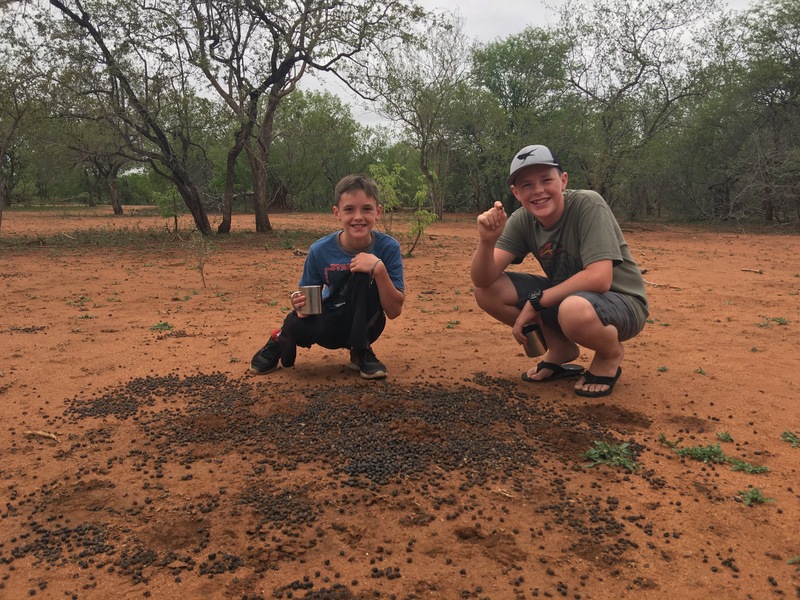 He most often used impala dung, like he and the boys did while we were there, but had been known to use giraffe dung as well if that is what was available. Both Parker and Tyler gave it a try after him, the rest of us opted to watch and let Francois claim the victory of “best dung spitter.” That’s a title I would be happy never to claim! It was entirely disgusting and entertaining at the same time! After our breaks, we would head back out to see more animals before returning to the lodge to rest. 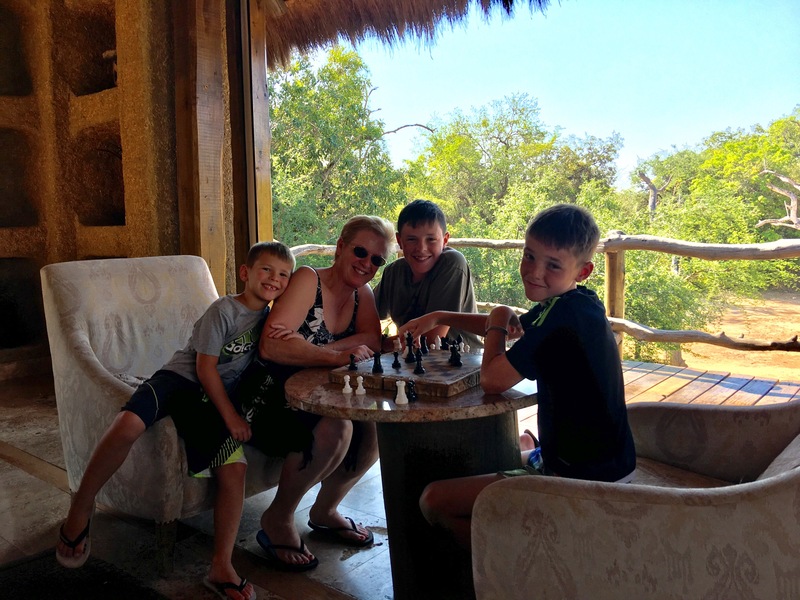 After we returned to the lodge, we had some time in the middle of the day for relaxing by the pool, going to the spa, playing chess, taking a nap, etc. 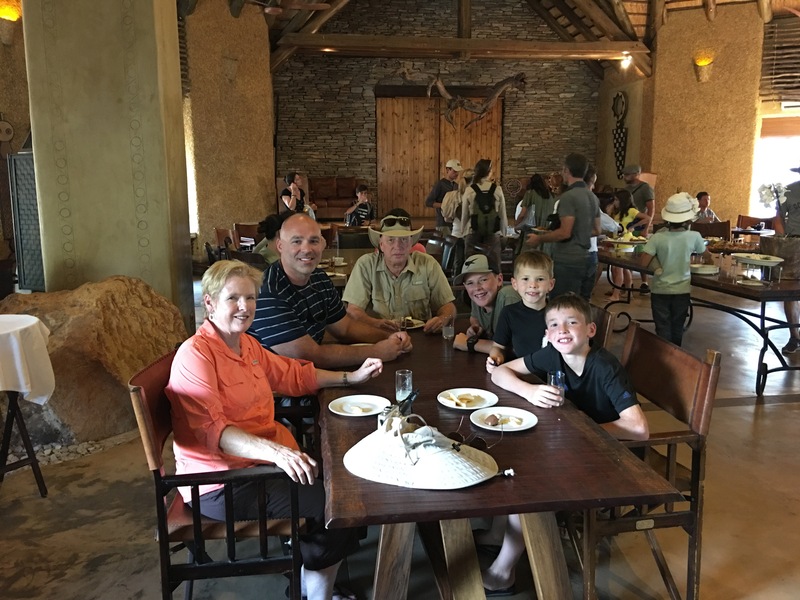 They also provided a huge breakfast when we got back, lunch, and high tea right before we headed out for our evening game drive. 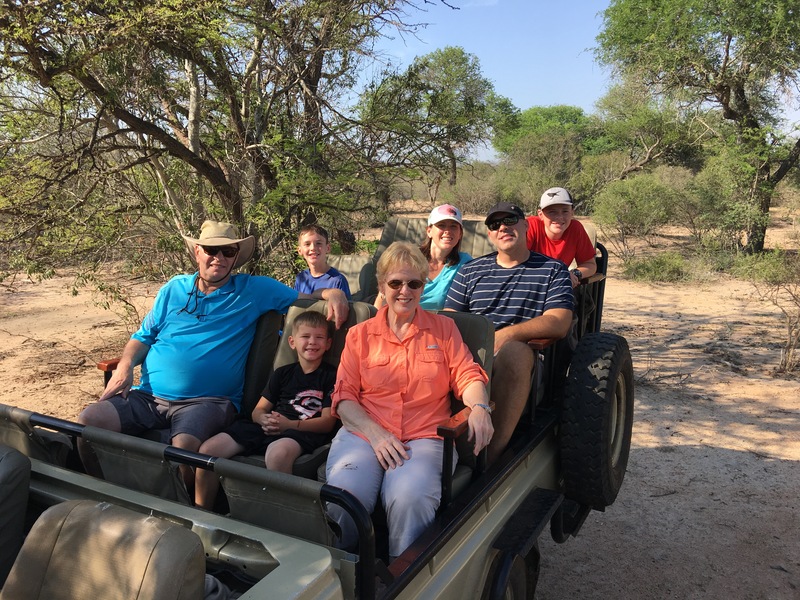 After our relaxing afternoon, we’d hop back in the safari vehicle, head out to another quadrant of the park and search for animals. 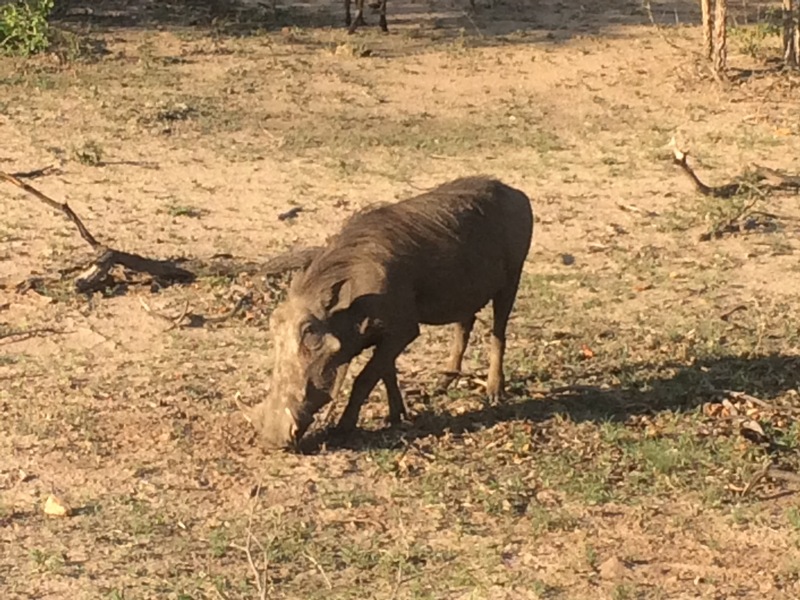 While there, we saw all of the animals we saw in Botswana as well as hyenas and rhinceros. We were also able to see lots of babies. 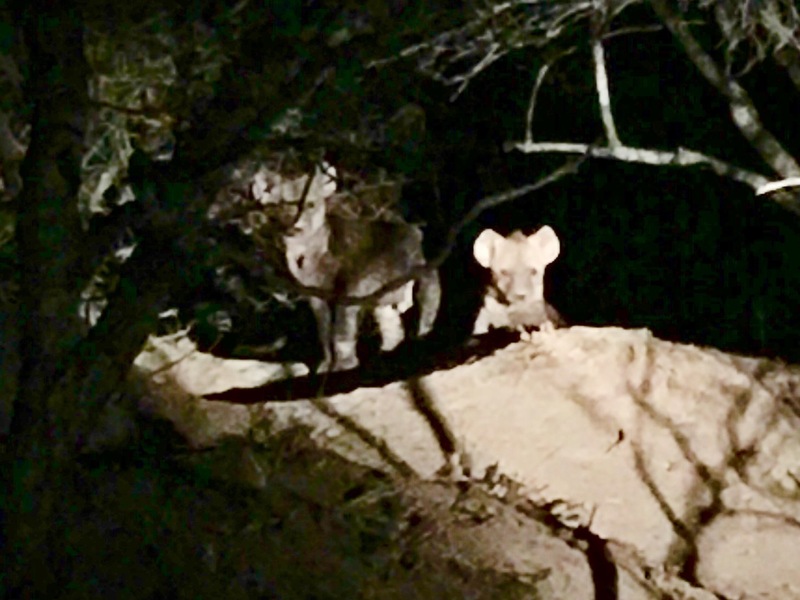 We saw baby black backed jackals, zebra, elephant, hyena, monkey, baboon, crocodile, and more. 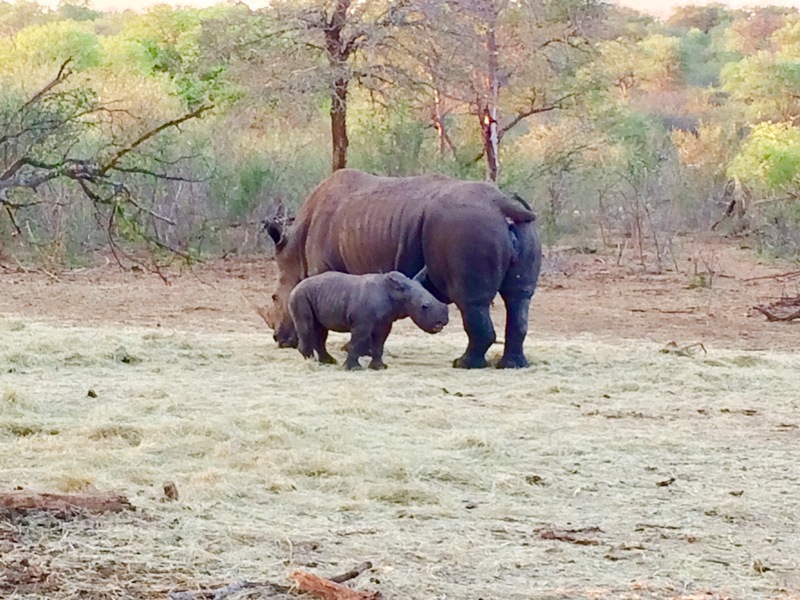 The most exciting thing we saw though was a baby rhino only 2 weeks old! This was so exciting because rhinoceros are under great risk of becoming extinct due to poaching. 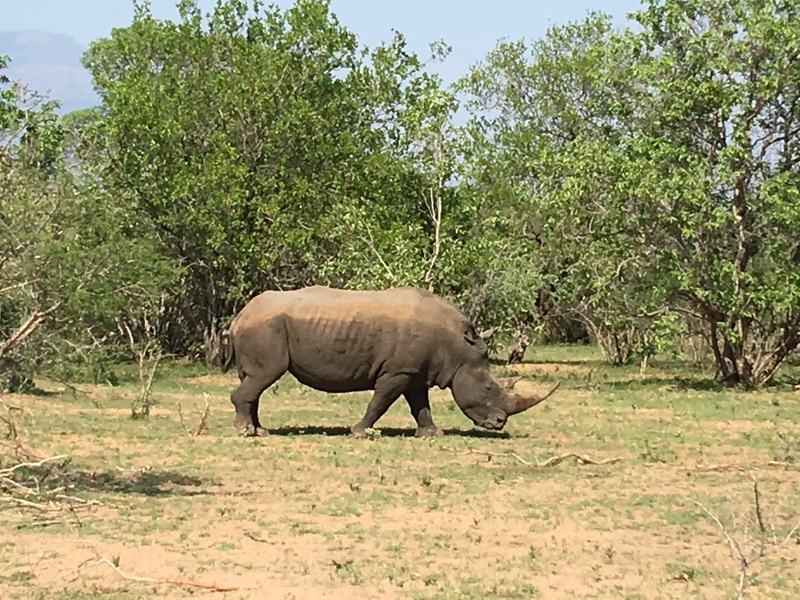 Unfortunately, some cultures believe that rhino horns have great medicinal value and the going rate for a rhino horn is $1 Million per horn. There is great effort put into anti-poaching, with the anti-poaching rangers even able to shoot on sight if they find someone poaching. Unfortunately, the reward is worth the risk for many, so the rhino is still in great danger. 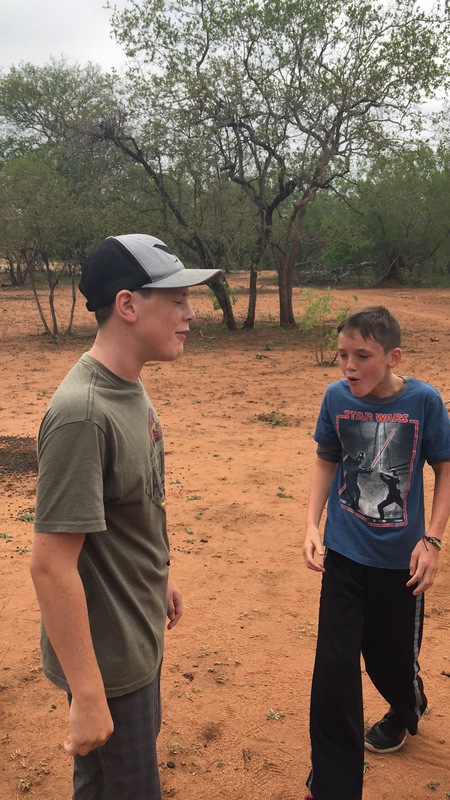 Francois told the boys at the rate we are going, our boys will not be able to bring their children back and show them rhinos in the wild because they will be extinct. 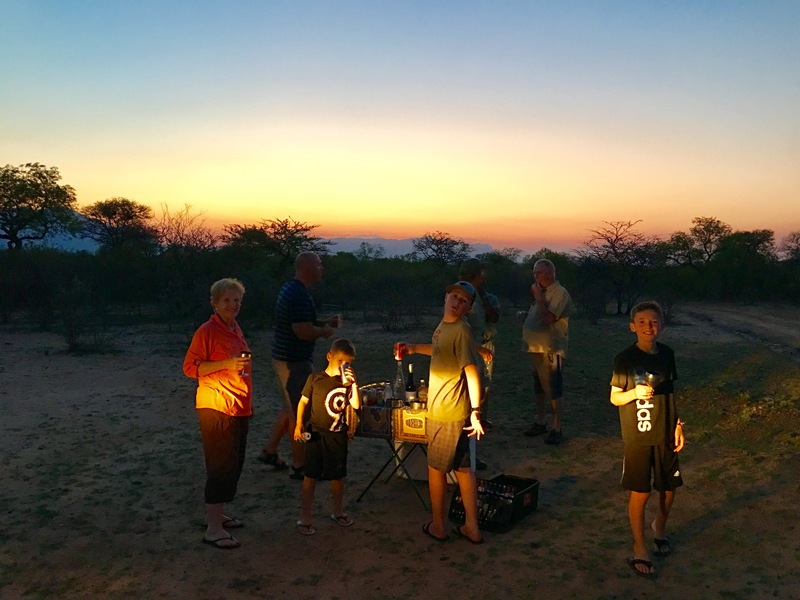 At sunset we would stop for a “sundowner” or drink and snack and stretch our legs. Francois and Lassi would set up a table and provided a variety of drinks, as well as biltong (sort of like jerky) and chips. 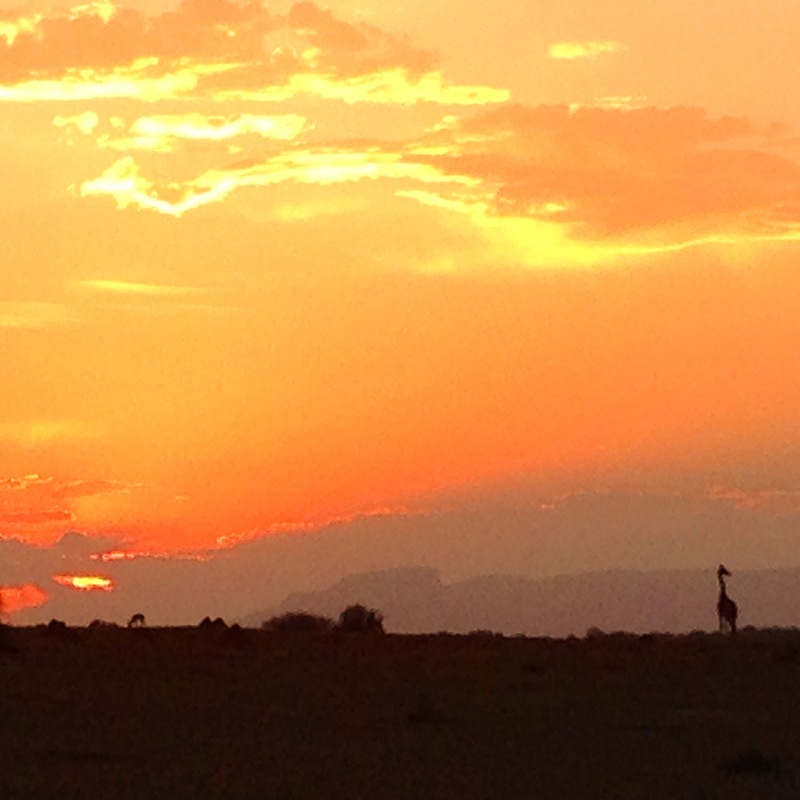 There is nothing like a sunset in Africa and we were able to experience some amazing ones! 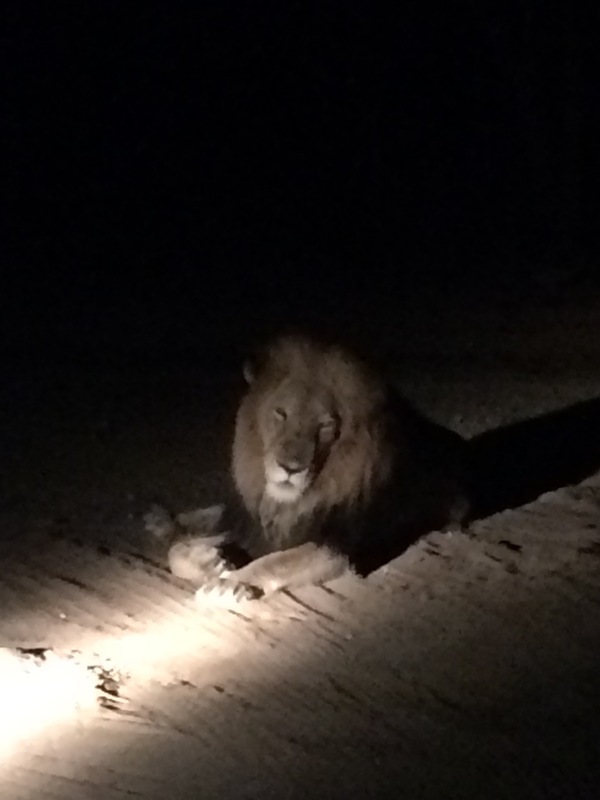 After the sun went down we stayed out on the game drive for around an hour searching for nocturnal animals. 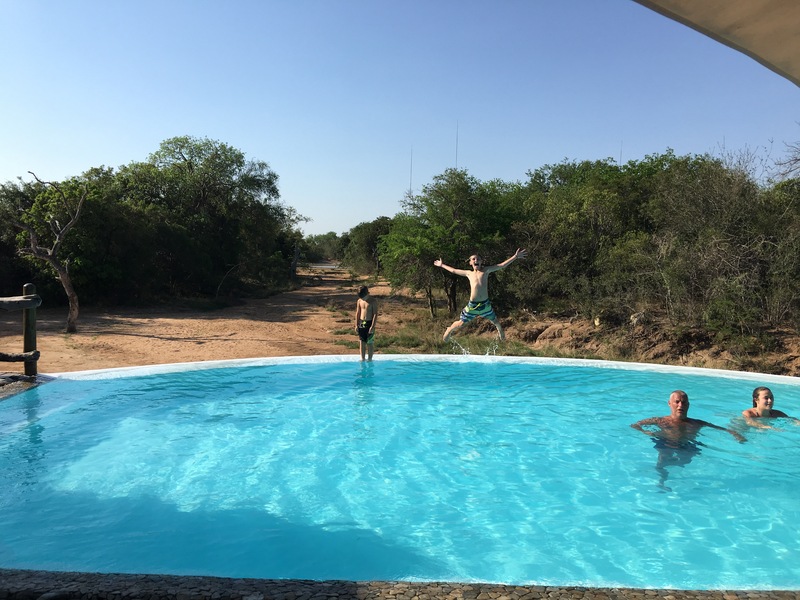 In Botswana, they didn’t allow you to be in the park at night at all for safety reasons so this was a little scary, but we put our complete trust in Francois and Lassi and they didn’t let us down. 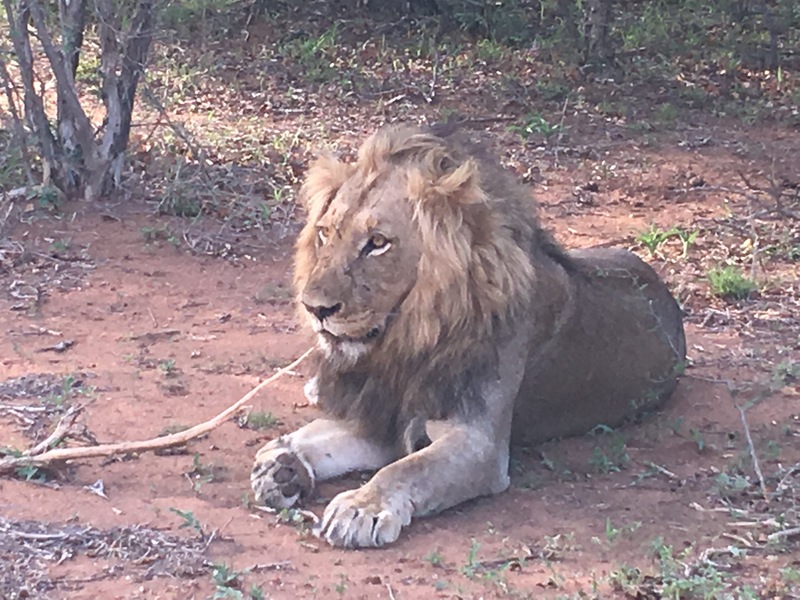 You can imagine our surprise however, when driving down the safari road we came across a lion lying right in the middle of the road! 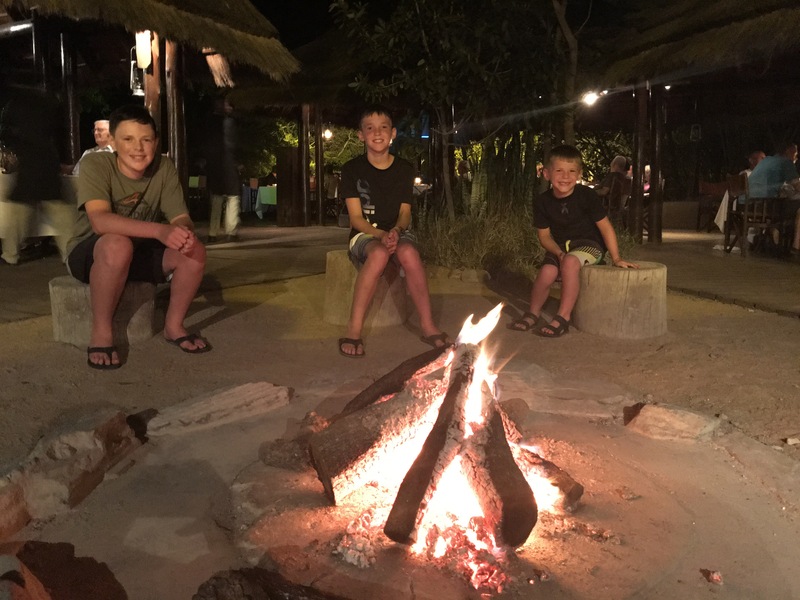 We weren’t able to see many animals at night, but we did see a bush baby, a Mozambique spitting cobra, a lion and some baby hyenas, which were all pretty amazing! After getting back we would go get cleaned up and then head over to our delicious dinner, set under the stars with a fire and singing. 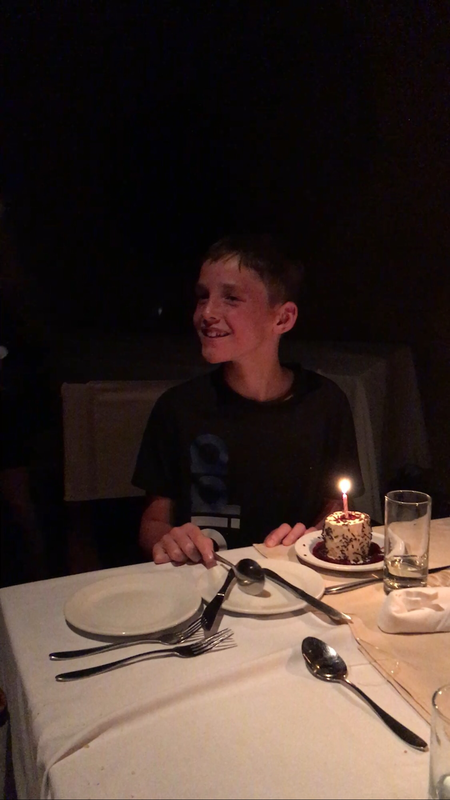 While we were there it was Tyler’s 11th birthday, so all the waiters came out singing and dancing and brought him a cupcake. It was a really unforgetable experience. After dinner we would head back exhausted and try to get to bed as quickly as possible to wake up the next day and repeat it all over again! 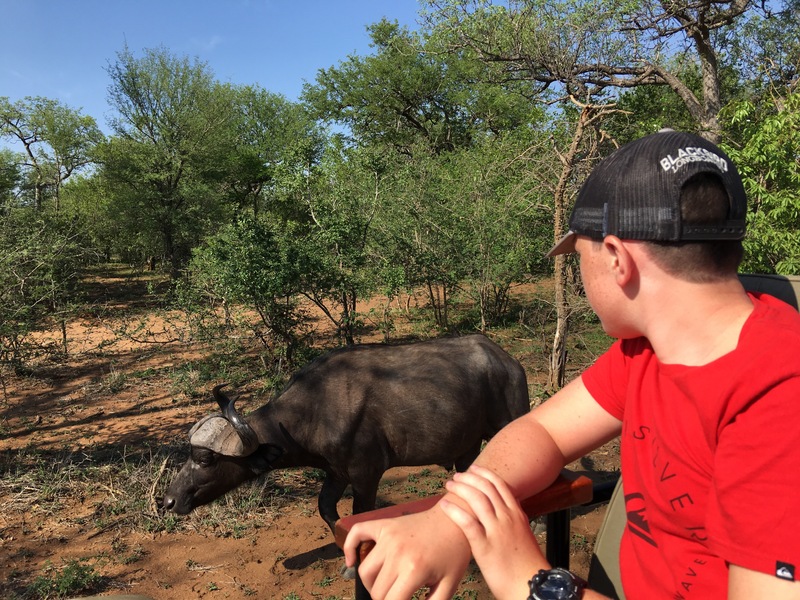 We had such an amazing experience at Kapama Game Reserve, but after three days of safari we were ready to venture out on our own to a new area in neighboring Kruger National Park. 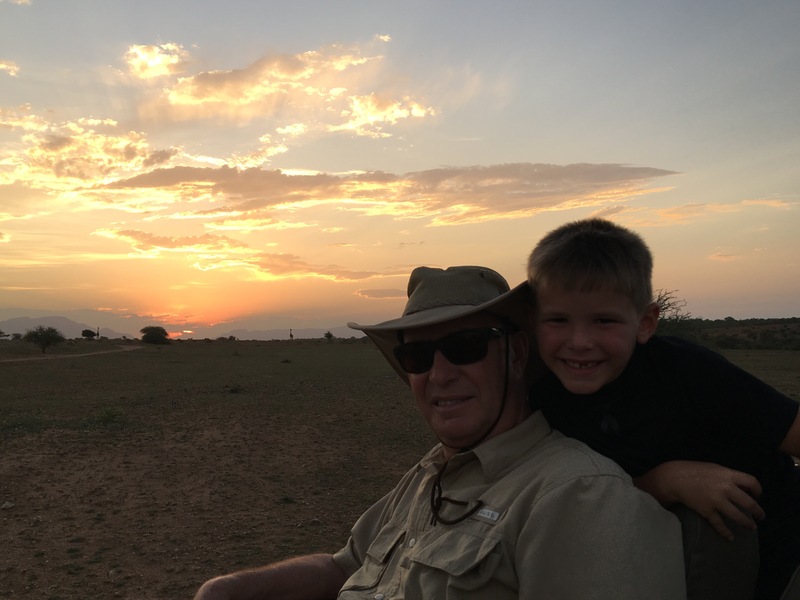 As we drove throughout our travels in Africa, we read the book, 101 True Tales from Kruger so we were excited to see what this amazing place had to offer. 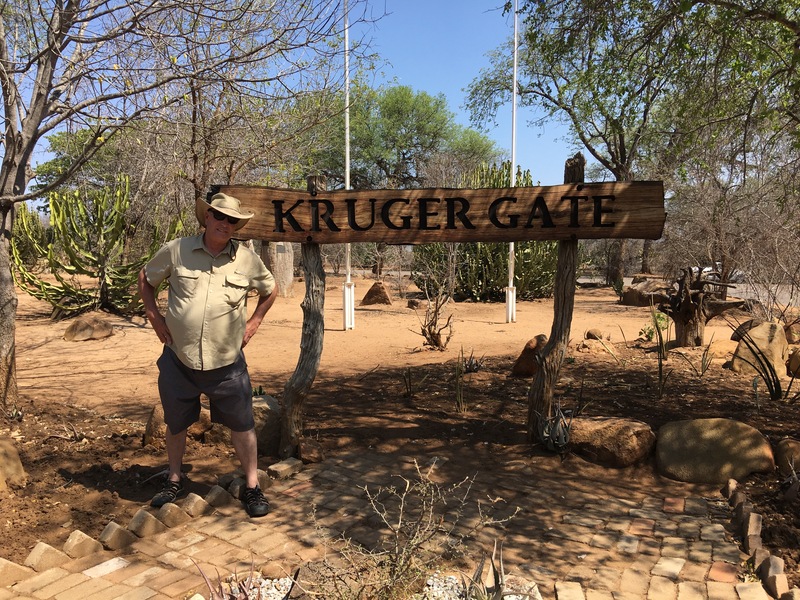 It has been said that if you drive on every road in Kruger National Park and could see 100 yards on either side, you would still only see 2% of the park, so we had a lot of ground to cover and only a day to do it! 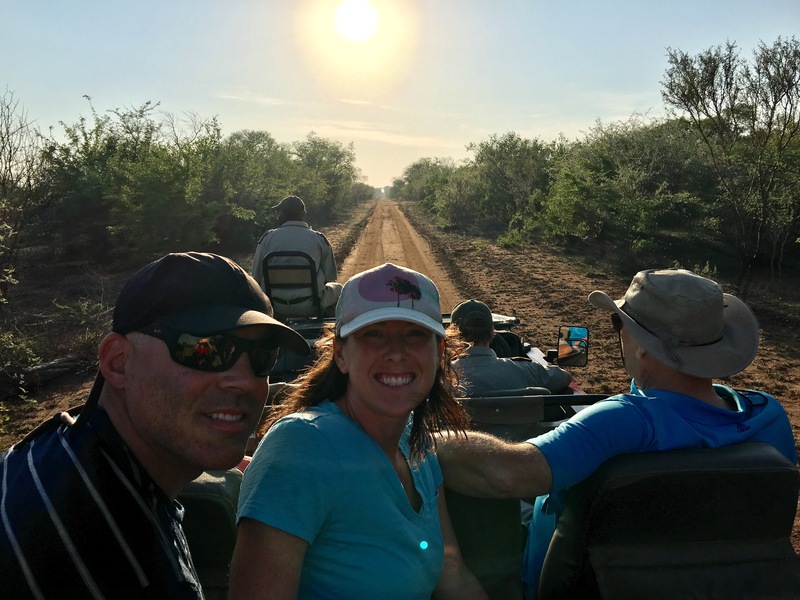 At first we didn’t see much, but as we continued through the park we saw elephants, hippos, impala, buffalo, and right before we left the park we were fortunate to be able to see two African wild dogs, which are endangered. 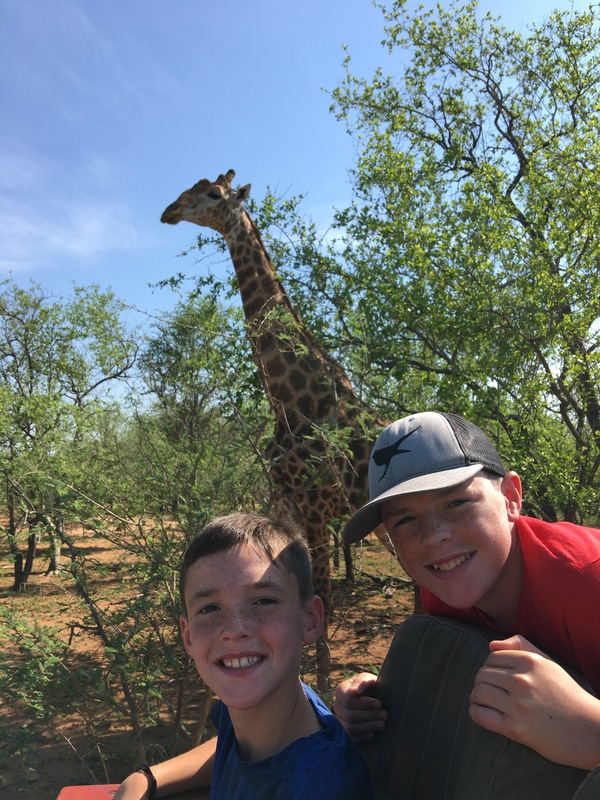 They are very rare, and Luke had been on the lookout especially since Botswana for them, so it was a great way to end our safari experience in Kruger. 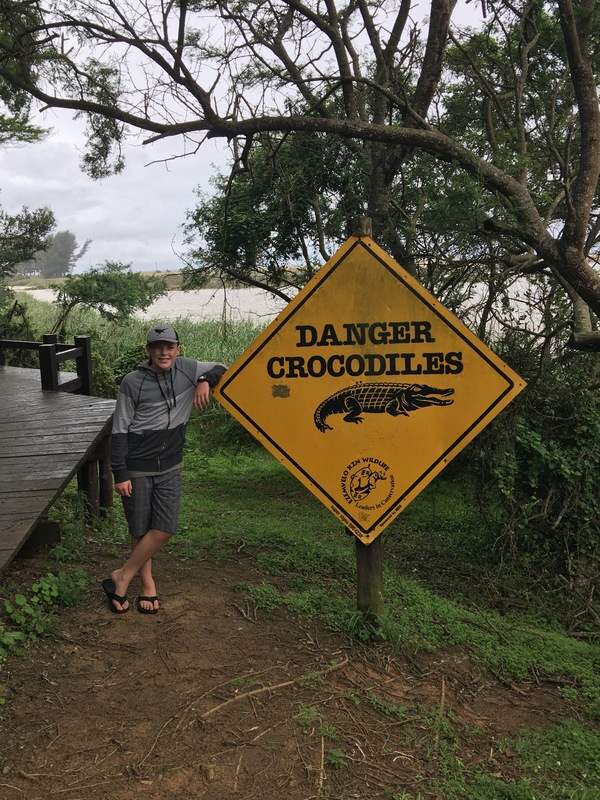 I would have loved to have spent more time exploring the area, but we were heading south though Swaziland to St. Lucia, South Africa. 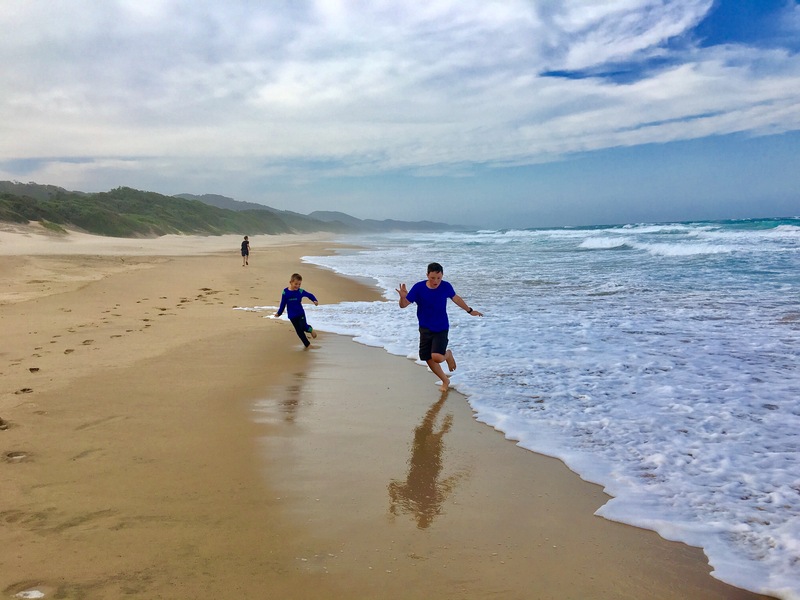 St. Lucia is a small beach town on the southeastern coast of South Africa on the Indian Ocean and at the tip of iSimangaliso Wetland Park. 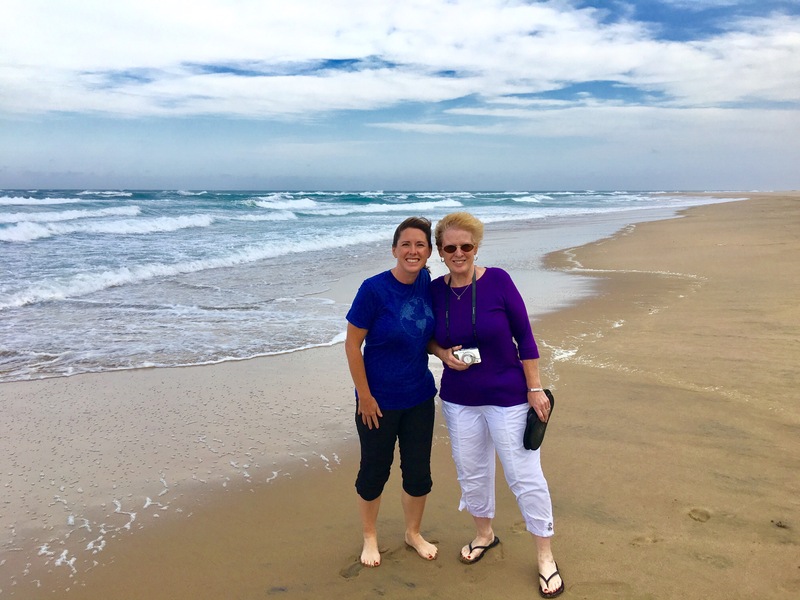 This was our first time seeing and dipping our toes in the Indian Ocean so that was exciting! It was pretty windy and cool so we didn’t swim, but it was beautiful. 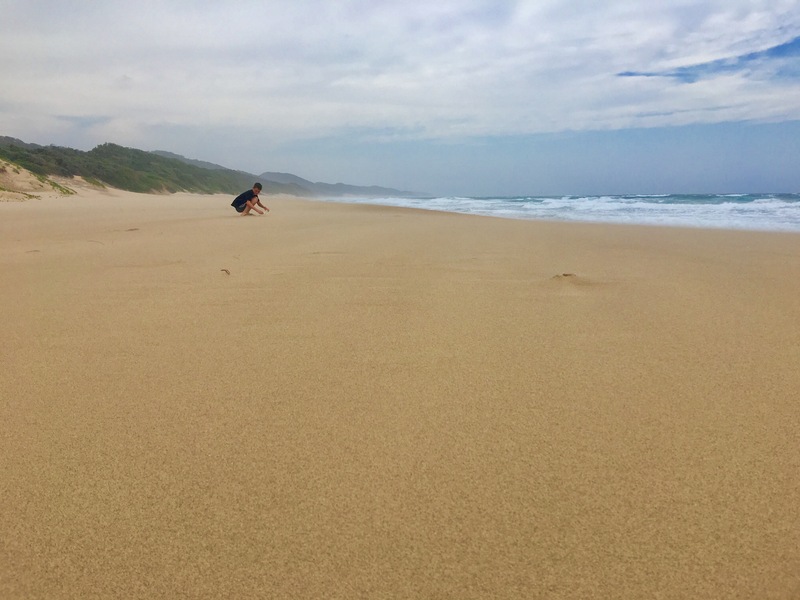 Although the beaches are beautiful, iSimangaliso Wetland Park is best known for it’s biodiversity, having over 6,500 plant and animal species known to live there, and has been named a UNESCO world heritage site. 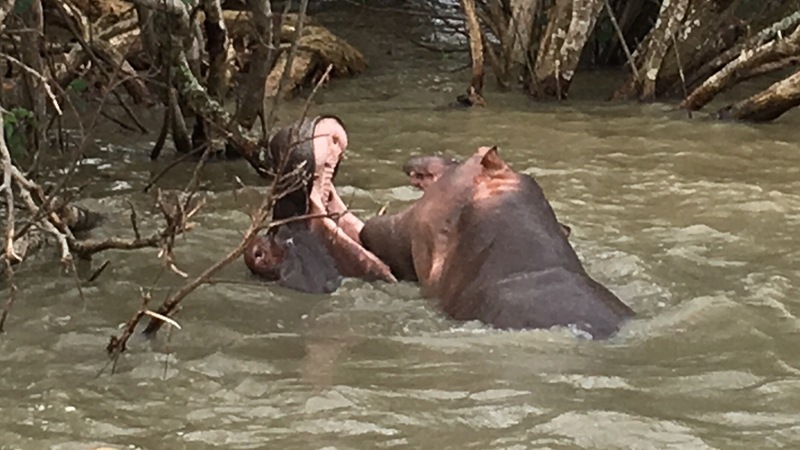 We chose to come to this town because we heard hippos roamed the streets and even drank out of our pool! 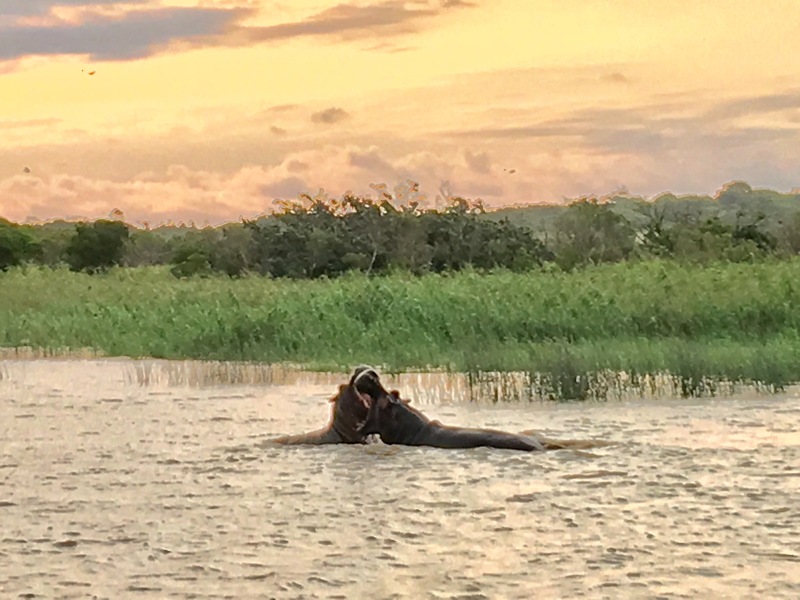 We didn’t have the good luck to see that, but we did have some pretty great hippo sightings when we were on our boat tour of the St. Lucia Estuary. They are also known for having a large amount of crocodiles in the area and while we were walking in the wetlands we did see two crocodiles! 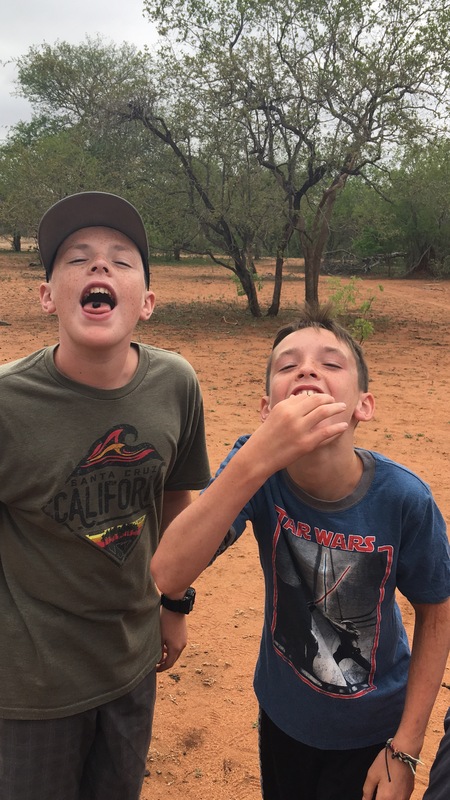 These were the two animals we didn’t really have great sightings of before, so we were excited to have the chance to see them in iSimangaliso. We saw two on this walk! We left St. Lucia and headed to Durban to fly to Capetown. 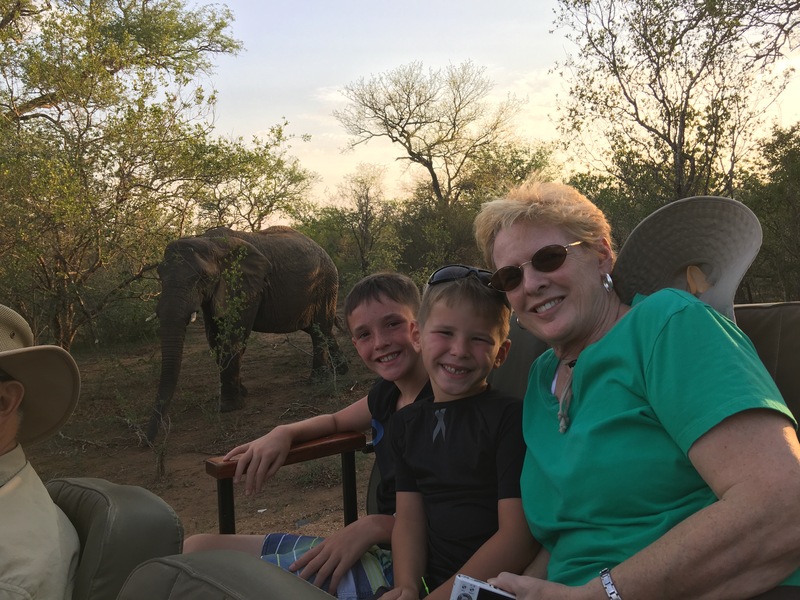 Our safari days were over, but we would never forget the incomparable experience of seeing animals in the wild as we traveled through the parks of South Africa. What an adventure! Wow – beautiful! Looks like an unforgettable experience. Thank you for sharing.